Jordan Catapano likes to mix things up. The professional bartender and mixologist serves as a cocktail expert for several online publications and blogs at www.thisgirlwalksintoabar.com, where she also sells barware and apparel (I bought the “Real Women Drink Bourbon” T-shirt, of course). Last year, she and her sister, Jocelyn Dunn Muhlbach, a graphic designer, pulled her know-how together into the book shown above. 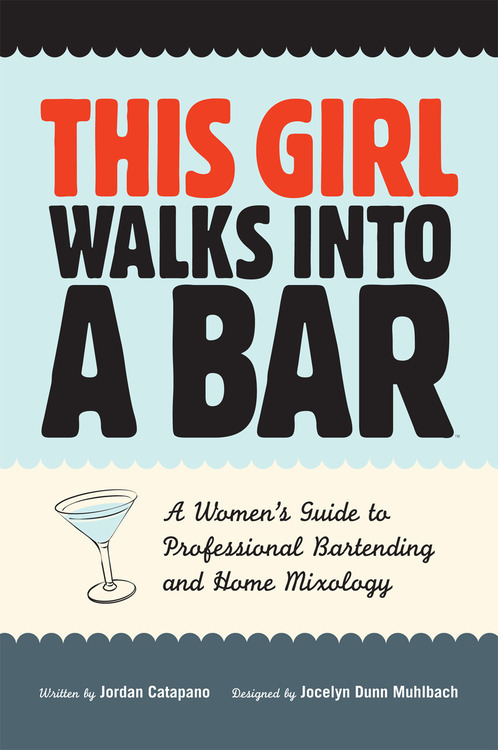 The first half of this breezy, tip-packed guide is aimed at readers who want to break into bartending – a perfect job for women, who God gave the “gift of multi-tasking,” Jordan writes. Even if slinging drinks professionally isn’t your calling, you’ll enjoy her insights into the pros and cons of different establishments, learn a lot about various spirits and discover how to deal with drunks – which always comes in handy. The second half is for those who want to up their game at home, and includes tips on building your personal bar, choosing the right tools and making garnishes. Best of all, there are 100 cocktail recipe flash cards in the back. You can order the book ($14.99) at the website. Jordan, shown right in the photo below, and Jocelyn recently took a few minutes to multi-task and serve up the answers to some questions from the Bourbon Babe. Q: The myth persists that women only like fruity, girly drinks, but obviously this girl enjoys her bourbon – straight up! In your book, you make the case that women also make great bartenders/mixologists. Why do you think this myth persists? Jordan: I agree with you about the myth. Most cocktail books written specifically for women contain page after page of sweet, pink drinks. I really take offense to such generalizations. For one, I think a lot of it has to do with marketing. Bourbon ads and commercials are clearly geared towards a male clientele, with their photo shoots taking place in leather-lined man-caves and on dusty, dry horse ranches. The bottle design and decor is often more masculine, sometimes even including strips of metal and pieces of twine, and therefore less appealing to a woman who is shopping to aesthetically populate her home bar without much concern for what’s inside the bottle. Q: What’s your favorite bourbon? Jordan: My favorite bourbon is Bookers, although I started off drinking Wild Turkey. Jocelyn: I’m really enjoying the Jefferson small batch whiskey. Q: What’s your favorite bourbon cocktail? Jordan: I prefer to drink it neat, but if I had to add ingredients it would be a dash of honey and a few drops of fresh lemon juice. Jocelyn: I quite enjoy a Bourbon & Ginger – easy on the ginger ale, of course. Q: You are expanding your empire beyond books and apparel to barware and other accessories. What’s next for This Girl Walks into a Bar? Jordan: We have three more books in the lineup, starting with the completed “This Girl Minds Her Ps & Qs,” an etiquette book for the home, restaurant and bar. Our gift sets will soon be available on our website and another line of T-shirts and home bar accessories. And then if my reality show, “Setting the Bar,” that I just filmed takes off, we may have to come up with our own line of spirits, too. Q: If you were a cocktail, which one would you be? Jocelyn: I’d probably be a Greyhound. I love the salt balanced with the tart sweetness of fresh grapefruit juice. Jordan: I’d be a bourbon Manhattan with lots of bitters and just a splash of vermouth.